This is a recipe that comes to us from Europe... from all over Europe are the French the ones that use it the most in their cuisine but that was about to change when it reached Mexico because it is used a lot in almost all the Mexican cuisine you will see it in enchiladas , soups , desserts, salsas , dips , garnishing dishes, etc. What is very important to clarify, is that this is not the sour cream that the whole world knows, this type of cream is different because its flavor is more neutral and is very creamy . 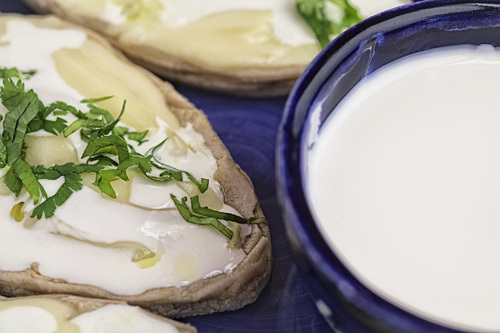 The Mexican cream is very easy to get at the supermarket but possibly you have the curiosity of trying it when it is prepared at home – we guarantee you that the flavor is much better. You will get amazed with how easy is to prepare the Mexican cream. It is very important to use whole milk in the preparation so the Mexican cream has the correct consistency and flavor. To make the Mexican cream butter is used, which should not have salt so it can be used in savory dishes and in desserts. In case of using salted butter, the Mexican cream can only be used in savory dishes. The preparation will take you less than 5 minutes but then the Mexican cream is left resting for 8 hours. Melt in a frying pan over low heat 3/4 of a cup of butter. Don’t burn the butter, while is melted, because it will no longer be useful. Transfer from the frying pan to a blender the butter that was melted. Also add in the blender 1 cup of whole milk. Transfer from the blender to a food container the mixture that was blended. Cover the food container, put it in the fridge and leave the Mexican cream resting for 8 hours, so it thickens. * The Mexican cream can be preserved refrigerated for 1 week. Did you like the Mexican Cream? This butter doesn’t have salt and it will give an excellent flavor to your Mexican cream. A whole milk of very good quality. Put the Mexican cream in this jar.